Located in Fort Collins, Colorado, Dr. Oddy is a psychiatrist with credentials in a broad area of psychiatric treatment (board certifications in psychiatry, consultation-liaison psychiatry, addiction medicine, holistic medicine, additional credentialing in interdisciplinary pain management), with expertise in the diagnosis and treatment of mental illness including depression, anxiety (including panic disorder and obsessive compulsive disorder), bipolar disorder, ADHD, and the management of alcohol and substance use disorders/addictive disorders. 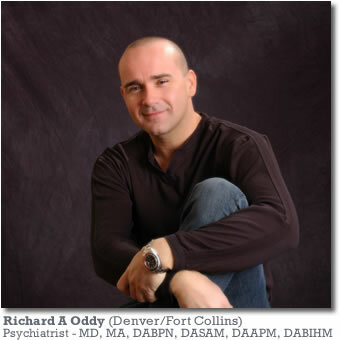 Dr. Oddy is a Fellow of The American Society of Addiction Medicine and a member of the American Psychiatric Association. In addition to his skills in diagnosis and medication treatment, Dr Oddy is also trained as a psychotherapist, and believes the relationship with the patient is central to treatment. As a psychiatrist and addiction medicine physician Dr Oddy is trained to manage mental illness and addictions together (e.g. bipolar disorder and alcohol or drug abuse), as they often co-occur (dual diagnosis or co-occurring disorders). Dr Oddy is able to bring a number of distinct areas of study into one practice. With the scientific background of a degree in neuropharmacology, a medical degree from the University of Cambridge, England, and psychotherapy training from New York, combined with psychiatry training, addiction medicine training, as well as chronic pain interdisciplinary management experience, Dr Oddy is able to appreciate relationships between the mind/brain and body. *Dr. Oddy’s practice in Northern Colorado is conveniently located in Fort Collins, with easy access for Greeley , Loveland and Windsor, Colorado, and Cheyenne and Laramie, Wyoming. Psychosomatic Medicine, Addiction Medicine, Collaborative Practice, Psychotherapy. Adults, adolescents. Suboxone management of opiate abuse. Evaluation and treatment of bipolar disorders, depression, anxiety disorders, including PTSD, childhood onset disorders including ADHD and ODD, schizophrenia, addictions, alcohol abuse and chronic pain. Psychotherapy and medication management. 1.Fort Collins Family Medicine Residency Program and Primary Care Clinic, Poudre Valley Health System: Core Faculty, Counseling and Wellness Services. Resident education, consultation and outpatient care. 2.Salud Family Health Center, The Children's Clinic: Consultation and outpatient care. Adult, adolescent and child, consultation services. Evaluation, psychopharmacology, lead clinician of integrated primary care mental health team, Suboxone induction and maintenance. Evaluation and treatment of bipolar disorders, depression, anxiety disorders, including PTSD, childhood disorders including ADHD and ODD, schizophrenia, addictions, alcohol abuse and chronic pain. Psychotherapy and medication management. Attending Psychiatrist (share responsibilities with one other psychiatrist and one psychiatric nurse practitioner) 1:2 call, working as part of a multidisciplinary team, supervising therapists, social workers, nursing, psychologist. Community involvement as physician member of Central Nebraska Autism Advisory Group, clinical work with autism and pervasive developmental disorders. 06/1996 - 06/2000 Residency in Psychiatry, Weill Medical College - Cornell University, New York Preabyterian Hospital, New York, NY. December 1994 Bachelor of Surgery, University of Cambridge, England. Department of Psychiatry, Mood Disorders and Dysthymia Research Center, Cornell Medical College - New York Hospital. Clinical work with three research studies. Co-investigator - this involved work in study planning and facilitation, work as a rater of symptomatology, and clinical management roles as psychopharmacologist in all three trials. 1. "Open-Label Evaluation of the Efficacy, safety and Dosing of Citalopram (Celexa) in outpatients with Depression." 2. "A Multicenter, Double-Bind, Placebo-Controlled, Flexible-Dose, Parallel-Group Evaluation of the Safety and Efficacy of Lamotrigine (Lamictal) in the Long-Term Prevention of Mood Episodes in Patients with Bipolar Disorder with Rapid Cycling: Incorporating Participation in Genotype Research - Optional for Both Patients and Sites." 3. NIMH funded study testing relative efficacy of four treatments for dysthymic disorder, Interpersonal Psychotherapy, Supportive Psychotherapy, Sertaline (Zoloft) plus Clinical Management, Combined Treatment with Interpersonal Psychotherapy and Sertaline (Zoloft). 03/1992 - 06/1992 Department of Pharmacology, Cambridge University, UK - working in neuropharmacology with the team of Dr. P. J. Richardson on investigation of adenosine neurotransmission in rat striatal cholinergic nerve terminals. 06/1991 - 09/1991 Department of Pharmacology, Liverpool University, UK - working in clinical pharmacology with the team of Professor A. Breckenridge, principally using high performance liquid chromatography techniques to define assays for anti-HIV drugs, especially ddC.